I am thankful for the sun and dry weather we've been having lately. It has helped me miss California less. Waking up and seeing sun outside is great for my spirits. I am thankful for my friends, past and present and to come. They are great; they keep me going day after day, not only when the going gets tough, but also when the going is pretty good. Food! Whew, I almost forgot to add that in here. Nature's bounty is pretty sweet. We have delicious vegetables, fruits, legumes and grains at our fingertips to explore, experiment with, and enjoy. Yum. My readers - I know there are more of you than I'm aware of, and I appreciate it when you stop by, whether it's on a regular basis or just by accident. Thanks for checking me out. I recently picked up Vegan Yum Yum from the library, and it is beautiful. What's more, the website from which the book originated is just as gorgeous and tempting. My devotion to Isa may be threatened by this "newcomer". The book is full of page after page of delicious vegan recipes. I really am a sucker for pictures, so being able to see not only what my food will turn out like but also how it will look as it's being prepared is a definite advantage. The author takes her own pictures, but they are all so crisp and perfect that it's easier to believe a professional photographer took them. Wildwood Garlic Aioli was recommended to me by a friend and I was dubious at first, not being one for sauces (we didn't really grow up eating them) or prepared products. However, I have been craving a good white sauce lately, and I happened to see the aioli on sale at the grocery store, so I picked it up and experimented with it on some leftover rice and veggies. Let me tell you, it was amazing. I added a few seasonings to it, such as cumin, basil, red pepper, as well as mustard and hazelnut milk, simmered it for about 5 minutes, then mixed it with the dish. It turned out so much better than I expected, and I became an instant fan. I think next time, I will try it with a pasta dish, such as vegan fettucini, or spaghetti, or maybe I'll add it to a pizza crust! Oh, the opportunities are endless. I had a taste for a traditional English breakfast after listening to the audiobook The Curious Incident of the Dog in the Night-time (by Mark Haddon), and decided to just try one out by myself instead of going to a restaurant and having to get all sorts of changes done to the order. 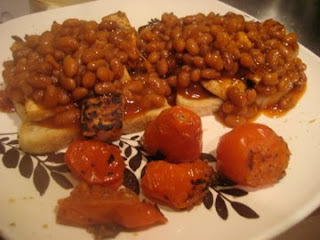 I cubed some firm tofu and sauteed it for a while, with basic salt and pepper seasoning, then toasted some sourdough bread, heated up veg baked beans, and quickly cooked some tomatoes that I have ripening in my bonus room. The result was satisfying and delicious. I went to the UK in college for a month and loved waking up every morning in a B&B and getting to eat an English breakfast. Although the English are not necessarily known for their cuisine (blech, haggis, anyone? 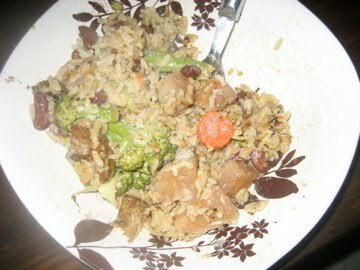 ), their breakfasts are really filling and will keep you going for quite a while. I tried out Bar of the Gods once again last night with some friends, and had something different for dinner than the last time I went. I had helped my best friend move all day, so I was tired and hungry, and wanted some good old vegan comfort food. 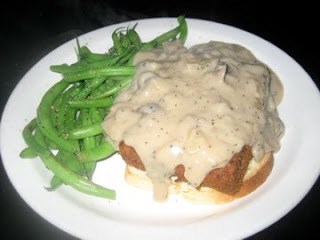 I saw the menu had chicken fried tempeh, with gravy and green beans, and thought it would hit the spot. It turns out I was right, and I was reminded yet again just how versatile tempeh really is. It can masquerade as a fake meat, but it can also be spotlighted as an entity all its own, like when it is simply crumbled and sauteed with a bit of oil, salt and pepper and added to some rice. Anyway, this meal, like the last, was great, and now I just want to keep going back until I've tried everything vegan on their menu. I think I've exhausted the amount of information I wanted to share. I wish you and yours a fantastic and restful holiday, hopefully with minimal unnecessary spending afterwards on Black Friday.